This entry was posted in Training & education on 2018/05/30 by Susan. 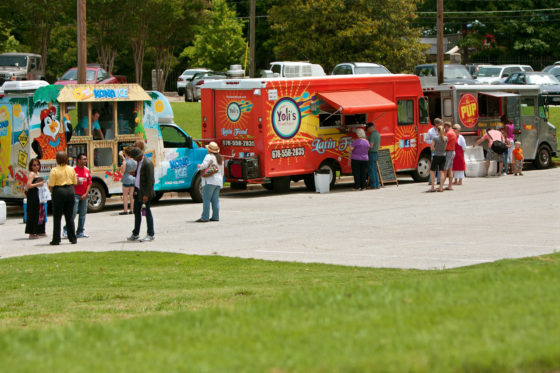 Operating a food truck is a dream for many. Here are some of the most common safety issues for mobile food vendors and tips on how to prevent them. Notice how many food trucks there are nowadays? Over the years, I’ve seen more and more of them. You can even download this Street Food App that – as I write this – shows me where to find the 36 street food trucks open in Vancouver right now. Safety for workers is one of many things to keep in mind if you’re starting a food truck business in B.C. Food cart permits and regulations vary by jurisdiction, so check what’s required in your location. Regardless of where you are, you need to think about safety for your workers. They face many of the same kitchen hazards as workers in traditional restaurants. These restaurants on wheels – surrounded by people, often with big line-ups – also present other unique hazards. This interactive tool from WorkSafe New Zealand shows some of the main hazards. Here’s a list of them, including a number of resources for British Columbia. You can also find much more information about safety in food and beverage services on worksafebc.com. Remember, too, that if you’re hiring workers for your food truck in B.C., you may need WorkSafeBC insurance coverage. Even if you don’t have workers, you may want optional insurance coverage for yourself so you’re protected if you’re injured on the job. Learn more at Need coverage? on worksafebc.com.